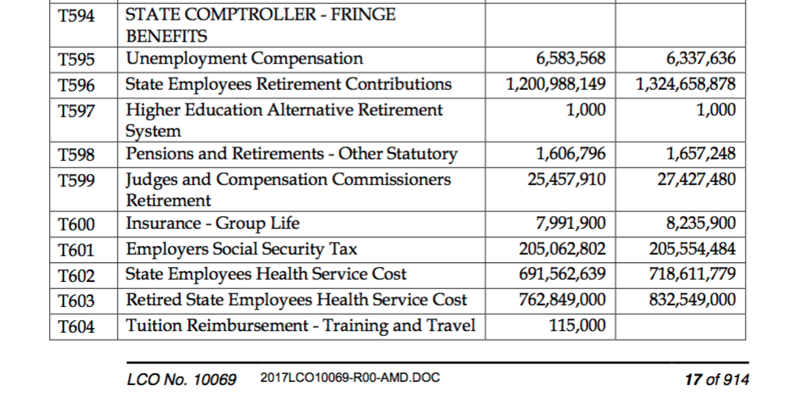 According to the new budget proposal released today, state employee fringe benefit costs – including pensions and retiree health benefits – will grow by more than $222 million. Overall, the new general fund budget will grow $214 million and a number of agencies took multi-million dollar cuts to make up for the increase in fringe benefit costs, including a $14 million cut to the Office of Early Childhood’s Care4Kids program and Temporary Assistance for Needy Families block grant. The Department of Correction will also see a $10 million cut, and the University of Connecticut will lose $2 million. The state’s contribution toward pensions and retiree healthcare costs made up most of the increase in costs. Contributions to the state employee pension system will grow by $123 million, and retiree healthcare costs will grow by $69.7 million. Known as fixed costs because the state is contractually obligated to pay them, the pension and retirement healthcare costs represent one of the fastest growing expenses plaguing Connecticut’s budget. Those costs will continue to grow in the future. During the 2017 legislative session, the state extended its payments toward its unfunded pension liabilities out to 2046 in an effort to keep the costs from skyrocketing. Even with the change, the pension costs will continue to grow from $1.3 billion this year to $2.2 billion in 2027. 2027 represents a pivotal date in the debate over the cost of state pensions and retiree healthcare. The legislature ratified a concessions deal negotiated by Gov. Dannel Malloy and the government unions, which extended the existing benefits contract out to 2027, effectively locking in those benefits for the next ten years. During the legislative session, numerous bills were put forward to reform Connecticut’s employee retirement system, including switching new hires onto a 401(k) style defined contribution plan and eliminating overtime payments from pension calculations. None of those bills made it out of committee. However, during the Senate debate over the concessions deal, three Democratic senators comprised a list of 12 reforms they wanted included in the 2017 budget as a condition of their approval. Those reforms included requiring the legislature to vote on every union contract and removing overtime payments from pensions beginning in 2027. Connecticut is one of only four states which sets employee retirement benefits through collective bargaining rather than in statute. Payments toward teacher pensions are also budgeted for an increase of nearly $42 million to $1.3 billion this year, with retiree health service costs growing another $9 million. Teacher pensions are set in statute and can be changed legislatively, although lawmakers have yet shown little interest in doing so. Those pension costs could grow to nearly $6 billion by 2032, according to a study by the Center for Retirement Research at Boston College. However, the 2017 budget proposal includes requiring municipalities to pay part of the cost of those teacher pensions. Similar to the deal made with the Connecticut State Employee Retirement Commission, Gov. Malloy has made a proposal to extend the teacher pension payments out to 2046, potentially shifting $21 billion onto future generations. It remains to be seen whether the governor’s proposal will be included in the final budget package.